Lloyd Meekins & Sons Auction Company is an experienced family-owned auction business, which has been dedicated to customers for over 35 years. From small-scale auctions to large multi-day auctions, Lloyd Meekins & Sons Auction Company offers the ideal approach when purchasing or selling equipment at our auctions. We know as you do, “time is money”, and we will make sure that your experience with Meekins Auction Company is a valuable and trustworthy one. Services are a component of business, which Meekins Auction Company offers our customers to the fullest extent. With our well-trained and experienced staff, we provide services in selling heavy construction equipment, heavy-duty road tractors and trailers, commercial/personal vehicles, farm equipment, aircraft, and real estate. Meekins Auction Company is licensed and bonded in numerous states and will obtain any licenses which are necessary to conduct an auction anywhere in the country. Advertising is another key element, which contributes to a successful business. Our mailing lists consist of over 20,000 prospective buyers, both nationally and internationally. Along with advertising and promoting our business on the worldwide web, we also advertise in national publications such as: Rock and Dirt, Top Bid, Machinery Trader, Contractors Hotline, Machinery Access, The Farm Chronicle and other well known strategic publications and in state, regional, and local newspapers. Meekins Auction Company guarantees you will benefit from our extensive advertising program. Location and Facility. 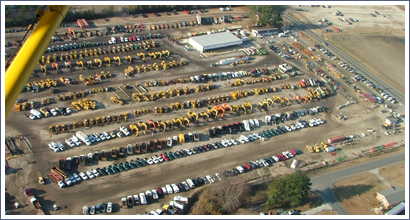 Lloyd Meekins & Sons Auction Company’s main sale site is located in Lumberton, North Carolina. Situated on 150 acres, which features a 3000 square foot all-weather drive-thru facility. We also provide 50 acres of parking for our customers. Lumberton is located on Interstate I-95, thirty miles north of the South Carolina border. Traveling distances include: 120 miles east of Charlotte, North Carolina, 80 miles south of Raleigh, North Carolina, 190 miles north of Charleston, South Carolina and 330 miles northeast of Atlanta, Georgia. Lloyd Meekins & Sons Auction Company believes in order to have a successful business you must work hard as a team. Whether you are interested in buying or selling equipment with Meekins Auction Company, we guarantee that we will take the extra steps to help fulfill your needs as a customer. Remember, “There is a Difference,” become part of the Lloyd Meekins & Sons Auction Company team, where hard work definitely pays off!